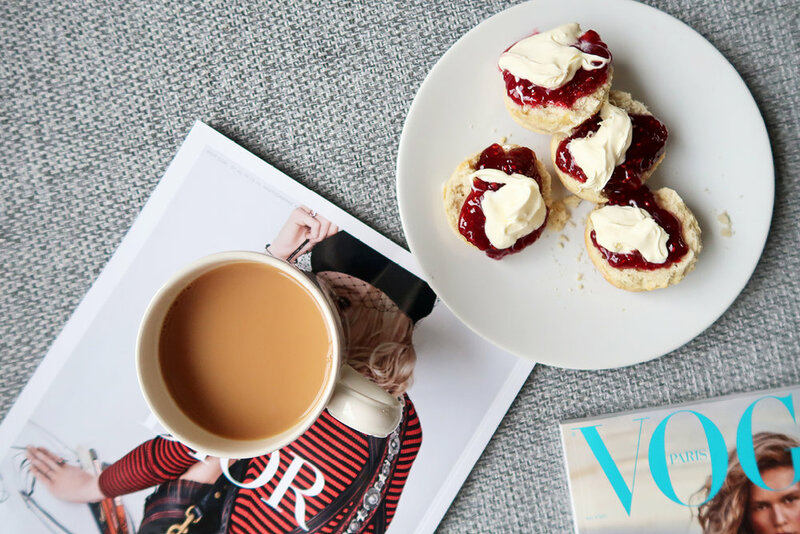 A British classic; whether you serve yours Cornish or Devonian style, I think we can all agree there's nothing quite like a scone. Find my recipe for simple scones below! Preheat the oven to 220C/200C for a fan oven. Sieve your flour into a large bowl, adding the salt and baking power. Cut the butter into cubes and add to the flour. Rub together until the mixture resembles fine breadcrumbs. Mix the vanilla extract with the milk. Make a well in the middle of the flour and add half the liquid. Combine together by stirring quickly with a knife. Add the second half of the liquid and combine again. Scatter some flour onto a clean work surface. Handle the dough until you have a smooth texture. Carefully roll out the dough so that it's about 4cm thick. Grab a cutter of your choice (I used an espresso cup because i couldn't find mine) and use to cut out your scones. Lay out your scones on a baking tray lined with baking paper. Whisk up your egg and apply as a glaze to each of the scones. Bake for 10 minutes or until risen and golden. Serve with lashings of clotted cream and your favourite jam (I chose raspberry, but appreciate strawberry is more traditional).